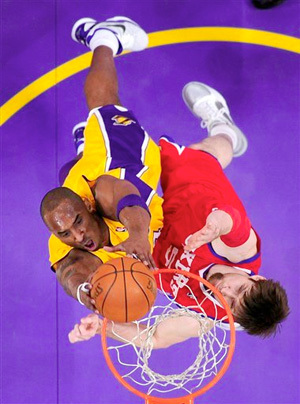 Kobe Bryant slams home two over Andres Nocioni. In a game the Lakers never trailed, they also were never able to put away the resilient Philadelphia 76ers, and needed some late points by Kobe Bryant to get a 102-98 win at Staples Center on New Year’s Eve. Bryant, who was held to a season-low nine points in a win in Philadelphia earlier this month, scored a game-high 33 points, including the tiebreaking jumper with just over 90 seconds left, as the Lakers hung on to get the victory. The win snapped a two-game home losing streak for the Lakers. The Sixers did have chances to win the game at the end, but UCLA-product Jrue Holiday missed a three-pointer late, and guard Lou Williams followed with the same with four seconds left. Bryant then hit two free throws to seal the victory. Pau Gasol had 20 points and eight rebounds, bouncing back from some recent sub-part scoring games. 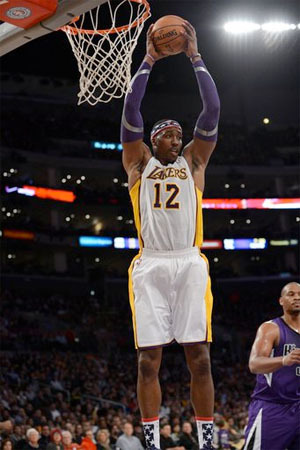 Lamar Odom had 18 points and seven rebounds off the bench, and Andrew Bynum scored eight points and grabbed a season-high 15 rebounds. The Lakers led the game the entire way, and by as many as 12 at one point, but the young Philadelphia squad kept hanging around. They trailed 52-44 at halftime, and 82-73 after three quarters, but managed to fight back and tie the game at 98 with just over a minute left. They never did score again however, as Bryant scored the game’s final four points for the world champs. For the second straight game, the Lakers shot over 50% from the field, hitting 42-82 (51.2%) against Philadelphia. The also dominated on the glass, 45-35, including 11 at the offensive end. However, they did only hit 4-14 (28.6%) from beyond the arc, as they continue to struggle from long range in recent games. The Sixers, who played without Andre Iguodala for the third straight game, were led by Holiday’s 19 points and 11 assists. Off the bench, Lou Williams scored 18, and Thaddeus Young had 14. In fact, the 76ers’ bench scored 44 of the team’s 98 points. The Lakers are in the middle of a three-game homestand that will continue on Sunday against the Memphis Grizzlies, who have already beaten the Lakers once this season, 98-96 back on November 13th at the FedEx Forum. The Lakers will play six of their next eight games at home, with only two of the games against teams with winning records (New Orleans and New York). With the schedule getting increasingly harder in the middle of the month, the Lakers need to take advantage and get wins against the weaker teams to climb back closer to the top spot in the Western Conference. 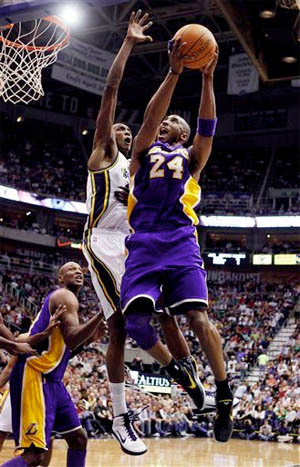 Kobe Bryant scores two over Luther Head. The Lakers’ longest losing streak in 2 1/2 years is over. Back at home on Friday, the Lakers made short work of the Sacramento Kings in their easiest win of the season, 113-80, ending a four-game skid. The champs came out focused from the start, and played strong defense from the opening tip to the final horn. They shot 56.6% from the field, and held the Kings to just 40.3%, including 5-16 (31.3%) from the three-point line. All stats were a vast improvement over what had been happening at both ends of the court during the losing streak. Kobe Bryant was the game’s leading scorer with 22 points, and got to be a spectator the entire fourth quarter during the Lakers’ largest blow out of the season. He played a little over 26 minutes for the night. Pau Gasol, playing despite a sore left hamstring, scored 16 points, with five rebounds, five assists, and three blocks in under 27 minutes. It was also a welcomed, short evening for Gasol, who has logged heavy minutes in recent games as the Lakers continue to try to get by without Andrew Bynum and Theo Ratliff. Lamar Odom added 16 points and seven rebounds, and the Lakers’ bench, led by Shannon Brown’s 14 points, outscored the Sacramento bench 52-37. The Kings kept the game close for most of the first quarter and trailed only 21-16 after the first 12 minutes. But the Lakers took over from there, leading 52-35 at the break, and by as much as 35 in the fourth quarter en route to the 33-point win. The 80 points were also a season-low for a Laker opponent. Jason Thompson led the Kings with 19 points and 10 rebounds, although most of his damage was done when the game was well out of hand in the second half. Tyreke Evans had 15 points, but continues to struggle with his shot, hitting just 5-15 from the field. A game against the struggling Kings was just what the doctor ordered for the Lakers, as they will head out on a six game road trip beginning next week, and are in desperate need of a positive swing of momentum before the two-week marathon. The Lakers next game is Tuesday night at Staples Center against another stuggling team, the Washington Wizards, who do boast one of the league’s most-exciting rookies, and the number one pick in the draft, John Wall.